Negotiations to renew the collective agreement of the unionized employees of the Groupe TVA took a new turn at noon today when employees stormed out of the workplace. This demonstration caused a blockage on de Maisonneuve Blvd. in front of the TVA building. The battle between management of the Groupe TVA, which is owned by Quebecor, and its 850 unionized employees, who have been attempting to renew their collective agreement, has been raging a few months. Their agreement expired on December 31, 2016. The impasse at the bargaining table mainly centres on the TVA’s practice of transferring work normally done by employees to other Quebecor affiliates such as Quebecor Media or even to the MELS studios. “There’s no doubt in our minds. If an agreement isn’t reached, we’ll exercise our right to strike. No way are we going to watch our jobs disappear and do nothing about it,” declared Marc-André Hamelin, president of the Syndicat des employé(s) de TVA SCFP 687. He also indicated that all that the membership is asking for is to be included in the Quebecor business plan and contribute to the company’s success by doing their jobs they are passionate about. In recent months, the employees have given two strike mandates. Voting in favour of pressure tactics up to and including strike action was 96.5% last June and 86.5% last August 26. 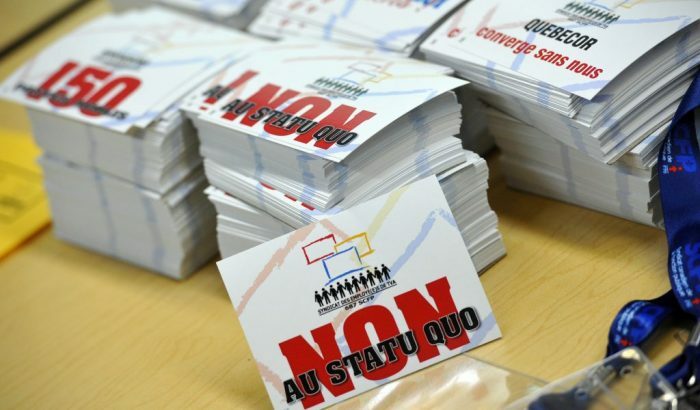 “We’ll use every means at our disposal to emphasize to Quebecor that convergence must also include respect for the union certifications of the companies it owns,” said CUPE union representative, Réal Leboeuf.